Our hope is that you are having a wonderful start to a new year. It has been a time of abundance of Family, friends, fellowship, and food through the holidays. In addition to that we have experienced an abundance in the out pouring of your love and support. Exceedingly abundantly above what we could think or imagine. There has been several times over the last few weeks that I have wept as I learned of your sacrificial and selfless acts of giving to those in need. As much as I was overwhelmed at the sight of those in need, so am I overwhelmed at the provision for those in need. Thanks seems to be so insignificant at the moment, but I know how thankful will be those who are the true recipient of your gift. 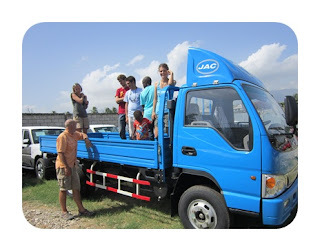 We arrived in Haiti on Thursday the 12th and were able to receive delivery on a truck for our transportation. Praise God from whom all blessings flow. Unfortunately on Friday after we arrived, a good friend of mine went home to be with Jesus, so I returned to the states for a few days for his going home celebration. Please pray for the Glynn Little family and friends. I returned on Tuesday of this week. Our next Goal was to find a place to call home. And yesterday we found a place to rent in Port Salut. Thank God for His blessings. Our Goal was for 100 homes, and God has provided nearly enough for 200 plus a truck, so I do not want to set anymore goals, but allow God to do what He wants in this. I was able to begin construction on about 15 homes in December and looking forward to following up to see where they are over this next week. Our goal is to empower families by giving them the construction materials they need to rebuild their homes. Please continue to share our vision and passion with others so we can continue to help those in need. They need you to be a voice for them. Sometimes in life, people come in who impact your life and make a difference. Mary and the group of ladies she does life and study with on Wednesdays, have been praying and providing for the homeless people in our area. Little did she know that God would allow her to meet the needs of a few people in need. So the Thursday before new years day in the middle of the afternoon, Mary calls me to let me know that God has placed three people without a place to call home in her paths. She had done the normal giving goody bags which she keeps in her car for this purpose. But today was different, God is speaking to her about helping with more than goody bags. She says " I think the Holy Spirit is telling me that I need to help these along the way to their destination by bringing them home, feeding them, washing their clothes, and letting them get a bath. My response is for her to abandon her fears and fences to do what she hears God speaking to her. Yes there was fears of being a woman with three men, and yes there was these fences up where woman should never help men. (by the way is this clearly is not the example which Jesus set for us.) So thankful that in this situation she is not allowing what our cultural norm would tell her. So she extends the invitation for these three guys and their injured pit bulldog to get in her car and bring them home. We I arrive she is preparing their meal and they are hanging out on the porch. They are so thankful and graciously appreciating the hospitality that Mary has extended to them. After diner I get them some shorts and under ware so they can get a bath and Mary washes their clothes. It was a cold weekend and Mary suggest inviting them to stay for a couple of days to stay warm and also participate in our annual family cane grinding. So we extend the invitation and they accept. The next morning they wash Mary's car before she goes to work, I go to work and out son leaves to hangout with friends, and they are there to fend for themselves. They interact with family and friends in the community as they find more new friends. Some are very accepting, some definitely have questions, but yet through it all they testify of an acceptance and love which they have never experienced before. On Sunday morning I awake early to take them to Jacksonville so they can continue their journey. One of the guys was searching for relationship and community, and one of my nephews asked him, "why are you running if you want relationship"? So a week later he returned to find the relationship and community he has been searching for. He is now living in our community, has a job and hopefully will find his relationship with God through a community who is representing Christ to Him. In the mist of all this, God continues to show me boundaries and fences we have up in our culture, which keep us from loving others well. I think many times people act out of what we think about them, so when we think the worst in people they act in the worst, if we think the best of people, then they act out of that value system. I am definitely guilty of profiling people and judging them by their environment or their relationships. A few days after they left, I realized that I did not even look in our home to see if there was something missing which they had taken, in part because all I have belongs to Him and in part realizing there is nothing materially this side of heaven which should keep us from demonstrating His love to others. Through sharing this story with groups and individuals, it has opened my eyes to many boundaries that we use which prevents us from hearing and following the Holy Spirit in our lives. Some have shared they would never pick up strangers like that, especially if I am a woman and they are men, or visa versa. Does that mean that you will not allow the Holy Spirit to let you be the good Samaritan to those in need. Does fear or cultural expectations of people drive us in such a way that we would ignore if God called us to do something outside the norm? Do we have material things in our homes which we want to protect, so we would never bring a stranger in our mist due to fear of loosing material things? So we say the Holy Spirit of the living God would never lead us to do that!! Hopefully we have not so blocked God out of such an intimate relationship he desires for each of us. I am so proud of my wife for allowing God to use her in such a way, despite the fear and what others may think about her following the leading of God. Mary and I are spending some time with our children Lori, Scott, Justin, and Kaitlin in Raleigh NC. As I think about this season, I think about those people close to me which I am thankful for, and thankful that God has allowed them to be part of my life. I am thankful for the wonderful relationships which we have together. We stepped off the back of the truck on the morning of November 12th into this yard where hurricane Mathew had tore down a house. We met this lady named Madlin who began telling the story of when the storm hit. As she tells her story there is the sound of children playing and a machete cutting wood in the background. Madlin continues her story as she holds a single screw driver and tells how it is the only tool she has today to remove her cooking pots and utensils from the rubble. She shared how her husband is a farmer and he is cutting the trees off the farmland with his machete so he will be able to plant crops. Then her husband Pierre comes up and shares how his goats and sheep were also a part of his family's lively hood and they too were taken away with the storm. Their story is one of many where entire homes were broken down and destroyed by the storm. I was overwhelmed by the great need there. Today back in America reflecting on what I am thankful for, I am so thankful for the relationships I have with family and friends. But as I ponder these things I am reminded of the world of broken relationships around us. Most live in pristine homes comparatively, but are hurting inside because of broken relationships. Many would even rather not celebrate the holidays because it reminds them of the broken relationships. 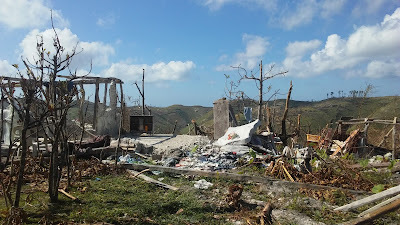 As overwhelmed as I am with the desperation of the Haitian people and their physical needs due to broken homes, so am I overwhelmed in America with our broken relationships with each other, which is the deeper cause of our division in America. There is Hope!! His name is Jesus!! He is in the reconciliation business. Someone once said How you respond to an offense will determine your future. Many of us are in the place of broken relationship because of how we have responded to offense in the past. It is not too late! We still have the opportunity to ask Jesus how he would have us respond so there is restoration in our relationships. Responsibility is our ability to respond. If we are followers of Christ, we have the power of the Holy Spirit working in and through us to do His good will, which gives us an ability to respond that others do not have. My prayer during this season is that if you are in a broken or strained relationship that your ability to respond will be increased and today you can make the phone call, send the letter, or visit the relationship for a new beginning. Praying for you and wishing you a Happy Thanksgiving. I would like to say thank you to those of you have been helping with the fundraising effort. We have reached over half our Goal of 100 shelters to place families back in shelters. And I do not want to limit God and what He wants to do as we make preparation to help those in need. 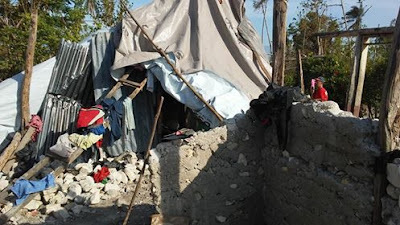 I was encouraged Saturday and Sunday as I visited the southwest of Haiti, by the number of tarps that have been distributed to help people in the relief situation. Again thank you so much for being a voice to those who do not have a voice. Above is a link which will help you understand and share with others the gravity of the need there. Please be in prayer for our transition over the next two weeks. I will return to the states on Friday. Then on the fifth of December I will return and ramp up the rebuilding effort. Mary will follow after the first of the year. Also be in prayer for our provision of a house and transportation for moving building materials. Have you ever seen a need and wondered who is someone that could actually meet that need? When I left for Haiti on October 10th, I was on a quest because several people had asked me who they could give to in order to help the victims of hurricane Mathew. So I went to the southwest looking for this person. There was very little help there and no contacts which I knew, so when I returned to PAP I looked in the mirror and I found the guy I had traveled six hours to find. God is so funny sometimes. So Mary and I are answering the call of God to return to Haiti for an indefinite amount of time to help those who have lost their homes in the wake of hurricane Mathew. I will be there the first of December and Mary will be there in January. There is a great need there and we need to be there in order to see it through. We have already begun to rebuild homes there. We have a plan to get some families in the village of Anike back in their homes. For four hundred dollars we can buy the materials to help these families as they do the labor to put their homes back together. So many people are asking what they can do. So many of you who are reading this have helped so much already. Thank you so much for what you have done. Prayer is the main thing always because we need discernment as we follow the Holy Spirit in all we do. God has called us to be a voice for those who do not have a voice. We extend that invitation to each of you. Will you be a voice for those without a voice and share with some of your friends who might be willing to give. We have set a goal of 100 homes, but believing God has called us to do more. May God bless you as you serve Him by serving others. Please be in pray with us concerning a place to live and transportation as we seek these out. Someone asked me what it was like where the hurricane hit. The only word that seemed to come to mind did not have to do with the physical state or the state of mind that the victims were in, but my own inner self and feelings which rose up. They are overwhelmed and helpless. 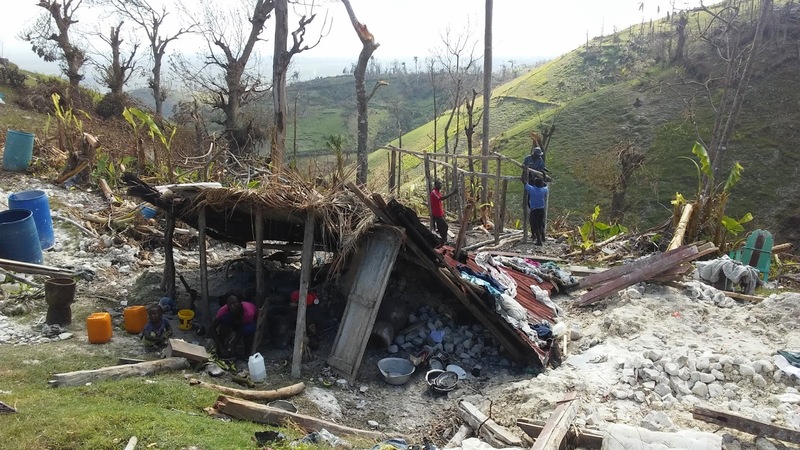 As I process these words, overwhelmed seems to be birthed from the magnitude of damage and destruction left in wake of hurricane Mathew in southwest Haiti. Helpless comes from seeing the hopelessness and desperation in the eyes of these victims, which causes me to ask what can I do? I alone realize I can do nothing, but knowing I belong to a greater body, (the bride of Christ who is making Herself known to the world and Heaven is declaring her Glory) gives me hope for the hopeless. Realizing God gifted each of us to do different task for a greater purpose and that is so that His creation can Glorify Him. Tuesday morning we loaded the truck with rice, beans, cooking oil, tarps, and water. It was a six hour drive to get to les cayes. We arrived after dark. We woke up before daylight and headed out as the night dawned to daylight, there was destruction everywhere. Trees torn down and stripped of limbs everywhere. The good thing was that most homes were in tact because of the concrete structures were strong enough to hold them together. After traveling for a couple of hours we arrive at Kapantye and then to Anike where there is mountainous farmlands, we began to see total homes torn off their foundation. 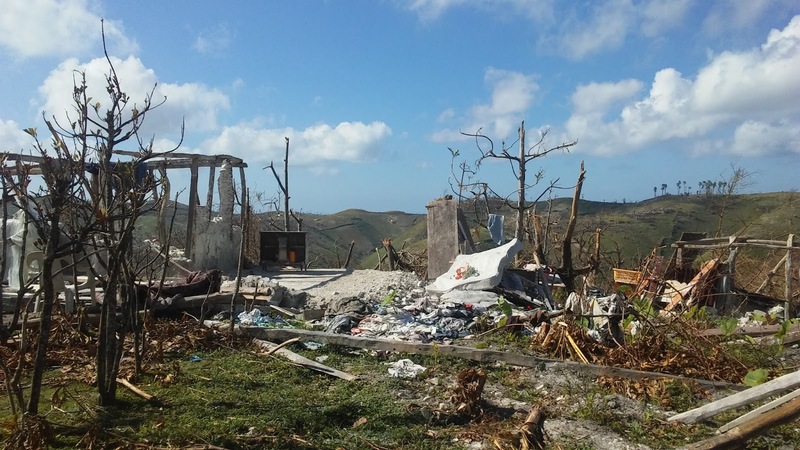 Fruit trees and gardens destroyed. 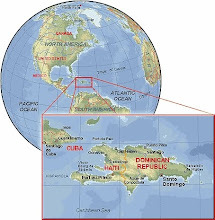 This is a place where people's survival is based on what the land produces and their gardens are destroyed with the grain still clinging to the pods, and coconut, banana, avocado, papaya, and mango trees strewn everywhere with premature fruit hanging from the lifeless branches. As we began distributing food in the area you could see the desperation on the faces, in the eyes and voices of each one. Most did not even have a tarp or shelter to shade them from the sun in a land now barren of shade and life giving fruits and vegetables. One woman took her shirt off to make a bag to put rice in. As we continued the journey of distribution, they were thankful but it seemed a little rice, beans, oil, and a tarp was like putting one of those bandages that do not stick. One man shared with us that it would take him over a year to rebuild and have a shelter for his family. There are thousands of people without power and no hope of even someone planning to help in the foreseeable future. What can we do. I have been talking with pastor CG. Most of these houses have foundations that can be built on. For 150$ we could buy cement to rebuild the walls. For 150$ we can buy metal for the roof to finish two 15x15 rooms. And 100$ will purchase wood, nails, sand, etc to complete the project. We are expecting the homeowners to do the labor and work with others in the community as volunteers. So for 400$US. People can have a shelter. I believe that together we can begin to rebuild 100 of these homes over the next few months. So what can you do? Can you buy the cement? Can you buy a roof, some nails, or possibly a house for 400$? Or it may not be possible for you to do any of the above but you could share this need with some of your friends and pray for us. In addition to the above, Mary and I are planning to move to Haiti for some time to see this through along with pastor CG. We will have living expenses and need a vehicle. Please be in prayer with us about these needs, and help would be appreciated. You can give via PayPal at christianlightminitries.org or send it to Christian light ministries PO box 23881 Jacksonville. Fla. 32256. Hope all is well with each of you. I would like to again thank you who have been praying for and supporting the work in Gonaives, Haiti. I was there the last week in June. I am continually amazed at what God is doing there through those who are there. The second floor of the school is looking great as construction continues on it. Below is a note from Kathy which gives an idea of what real change is about. The medical clinic is running well from the original building. We have placed the construction of the new medical clinic building on hold while focusing our efforts and resources on continuing with second floor of the school so it will be available when school resumes in September. 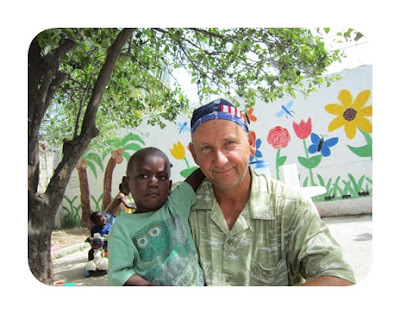 Brian has arrived in Gonaives this week and is working on the school in order to get the roof on before school starts. 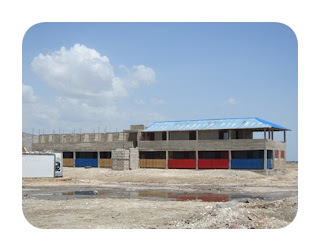 Please pray for funding to complete this and to continue with the medical clinic. Most of the team are here in the states, now, working jobs for support for next year, Please continue to pray for each of them in their different roles. 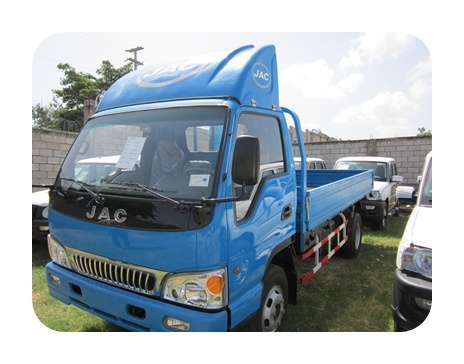 The Kia truck which we have in Gonaives has been a very good and dependable machine, but is in need of some rest. While I was in Haiti, Beaver and I were able to place a deposit on a new truck which will be for transportation to and from PAP with teams and supplies. Since then, there has been $20,000 committed to the truck and we are need of $10,000 more. Please make this a matter of prayer. If you would like to donate to the truck, please donate at muchministries.com See photos of truck attached. 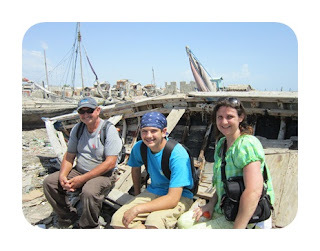 Brian, Cody and family are making plans to move to Gonaives in September. Please pray for them as they make this transition. 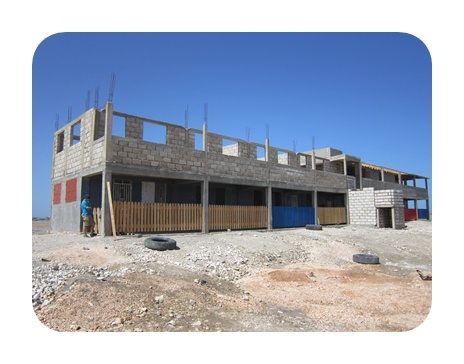 In addition to working on the school roof this week, Brian is continuing work on the living quarters for his family. God is leading us to have another time of prayer and visioning for Haiti. This will be held August 9th through the 12th at Honey Creek in Waverly, Ga. Please pray for us as we come together to look for the vision of God and the work is expanded. Please continue to pray for funding for medical clinic and truck. Also pray for the team and upcoming prayer and vision week end. A note i wrote about my week....thought i could share it with you guys ! Borrow me, Can i have a loan. Ba'm ti kob. A little money. this week i noticed an increase in this request. It is not unusual for folks to ask for money straight out for a specific need for a medical situation, or a school bill or a bit of a hunger issue. But it was a little disconcerting to have four or five of the folks that i know are working in the guilds that are making, baskets and jewelry and rugs and such asking for loans. So I start asking, What is going on? where is the money you just made? ~ many ( 40 ) that i know of have started savings accounts. Each week they put in so much into their account. They do this in groups. and each week one person gets the whole pot. So if 10 people put in 100 dollars each week, each week, for ten weeks, one person gets 1,000 dollars. Which is an awesome way to save money, invest in others in your community and there is plenty of healthy community "support" to make sure you keep the deal. ~ They are also investing in live stock, starting other small businesses and putting money back (usually someone else is holding for them) for school fees and supplies coming up in September. So therefore, they have a shortage of " pocket money " because they are thinking Forward , Investing. They (someone somewhere) told me it takes a year of consistent sustainable income for us to change the way we see our resources. If we never leave the feeling of desperate, we will always use money for relief for the moment.....but if we begin to gain confidence...we will plan for the future. ~ Two of the ladies that make Angels and have been with us for many months now, pulled me out of the workshop the other day...wanting to show me what they were working on (I thought great...they want me to buy something...where is my faith? ) but NO, they wanted to show me that they were in the middle of building new real Concrete homes, elevated out of the mud ....to replace the mud and stick and tin homes they are presently in. They were BEAMING with pride. They kept hugging me and saying thanks to God for bringing businesses to Jubilee. Anyway, this precious friend said, no mommie , no....You GAVE me..Ou te prete mwen....a loan last week...as she slipped the bill she owed me into my hand ! Mary and I will be leaving on Saturday for Gonaives. A team from our home church, consisting of our Pastor, my sister, and some dear friends, will be going with us. Mary will return with the team on the 21st and I will be staying until the 5th of Feb. We continue to be excited about what God is doing in Gonaives and specifically in Jubilee. We are looking forward to seeing what God has done and continues to do in and through His servants there, as relationships grow in dept and number for the Kingdom of God. Please note the change in our stateside phone number. In the past weeks I have had the opportunity to talk with several people who are going for the first time. As many of you who have been, the common theme for the first time is nervousness. As I have pondered this, I recognize it is in nervousness and the unknown places, that our dependance must be on God and not from ourselves. We have a great desire to know the future, and therefore, it is the unknown of our futures which, in our American culture we seem to have everything under control and able to handle everything, so we do not need God's dependence. In Haiti, you never know what the next hour or minute will hold, so you can develop a lifestyle of depending on God and looking for His presence. My prayer as we take this time in Haiti, that we depend on God each moment and look for his presence and may we never return to a place where we go though a day or hour where our very survival and livelihood is not totally dependent upon our Savoir. May our plan "A" be to depend upon Him and our backup plan "B", be to depend upon Him. Please pray that this time for us will be a time of spiritual transformation and an awakening to His ever presence and awareness of His desire to live in relationship with us. We have received additional funding from Cross International to continue construction on the housing project. We should be able to place 8 more families in homes while we are there. Brian Smith will arrive in Gonaives with us in order to lead this effort. We are very thankful for Cross International and those who support their idea of serving the poorest of the poor. Please continue to pray for us and this process, along with the recipients. In addition to this housing, church in Gainsville Ga. has constructed several pre-fabbed homes which were shipped over on the containers. Butch Bennett will be Visiting Gonaives next week and we plan on erecting some of these. We are thankful to Gainsville First United Methodist Church and Their contribution to the work in Gonaives. In addition to the above projects, we will be starting the foundation for the medical clinic. The clinic will have 6 private exam rooms, 2 birthing rooms for the midwives to use, , lab, a pharmacy, office, waiting area, and restrooms. It will be a great benefit in the service of the Jubilee community, not only for service, but also in job skills training for medical professionals. We are grateful for those of you who have contributed towards this. We will need an additional 90,000 dollars to complete this project. Please keep this need in your prayers. Kylie has been in Atlanta for the past two weeks for treatment. Her doctor reported that her MRI showed a decrease in the size of the Tumor. While The family and I rejoice with this news, she still has a long way to go. Please continue to keep Kylie in your prayers. Yesterday at 11am Kylie's brother was born. Mother Rebecca, and baby are doing fine. His name is Aiden. He weighed 6lbs 15oz and 20 inches long. Today marks the 2nd anniversary of the earthquake in the PAP area. They are estimating 316,000 lives were lost from the earthquake. The country is taking a time of remembrance today. Please pray for these families. 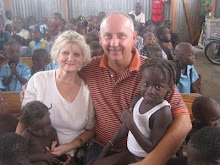 Emory & Mary have been working in Haiti for over 8 years. Six of those years were short term. Emory & Mary went full-time for God in March of 2008. They are currently ministering in Gonaives and Jubilee Blanc. Please look back often to see updates in their ministry, prayer request & ways you can personally help. * Provision of food, shelter, comfort to these families. * Spiritual wisdom and insight for us and the teams who are working here. * Those who lost love ones but have never found them.